The black Aarhus Jazz Festival T-shirt with the 2018 design is sold at the concerts on Bispetorvet from 12.00 noon to 9.00 pm. Price: 100 DKK. The 30-year anniversary poster designed by Finn Nygaard with a depiction of Stan Getz in the size 70 x 50 cm is sold for 50 DKK on Bispetorvet from 12.00 noon to 9.00 pm and at Musikhuset’s box office during the entire festival. The Finn Nygaard posters from previous years in various sizes can be bought by contacting Finn Nyggard via www.finnnygaard.com or tel. (+45) 21 63 06 30. 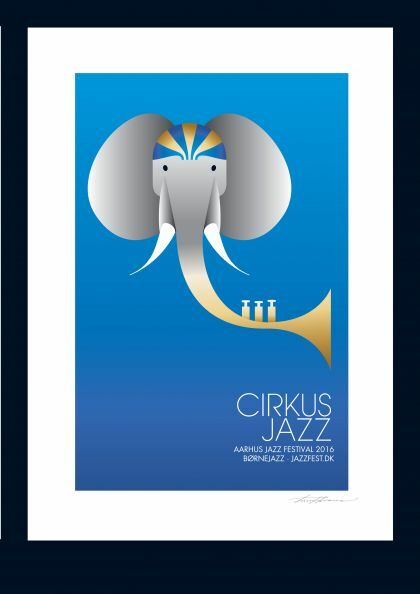 This year’s poster, Finn Hjernøe’s children’s jazz posters ’Cirkusjazz’ with the elephant motif, many festival posters from previous years, and the 2018 T-shirt can be ordered by contacting our office at Godsbanen, Skovgaardsgade 3 G, DK-8000 Aarhus C or e-mail to info@jazzfest.dk.